This month we found that headphones can bring much comfort and convenience. Kids watch movies, play games, and do homework using various digital devices. Having quality headphones is very important. Most headphones designed for kids are big, often fell off and break easily, so children need something better, more comfortable, durable and easy to use. Teddy had pretty good headphones with volume control, but they broke up because made of plastic and our little one took them everywhere with him. Regular headphones do not fit his ears. CozyPhones come as a headband with headphones set inside the band. The headphones have flat shape, so to set them you just need to move them to kid’s ears inside a headband and the device is ready to use. CozyPhones headphones and a cord have very good quality: durable 36 inch braided cord and sturdy 3.5 mm stereo plug. So it is not easy for kids to break them up: . 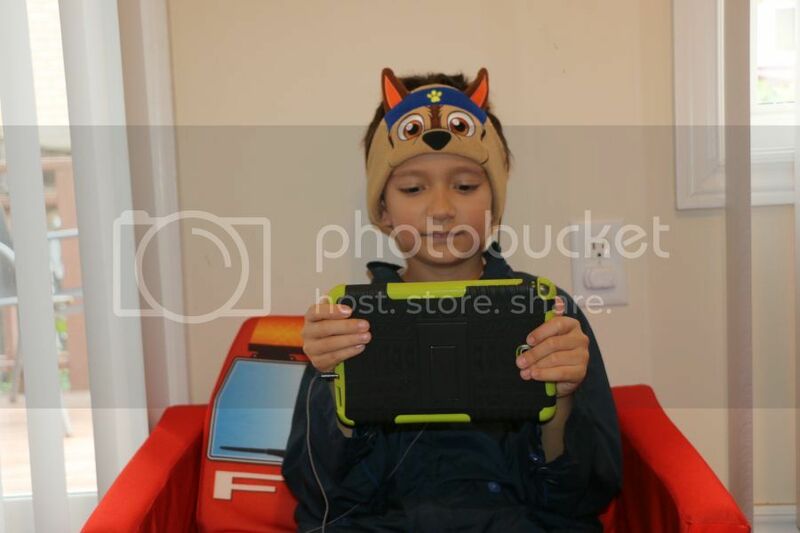 CozyPhones headband is made of soft fleece material to be gentle on child’s head and the best thing you can choose the character for headband. You can take a look at CozyPhones wide selection cute characters like panda, frog, unicorn and many others. 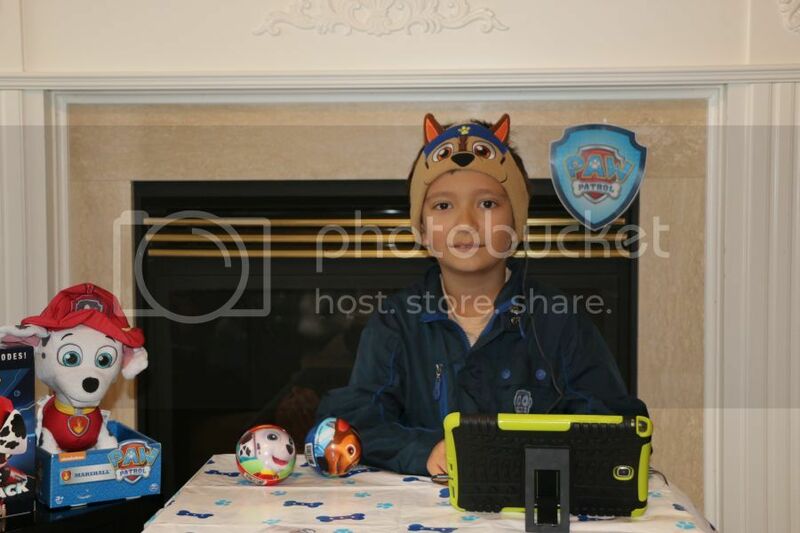 Recently the company launched limited edition headbands, inspired by Nickelodeon Paw Patrol series. 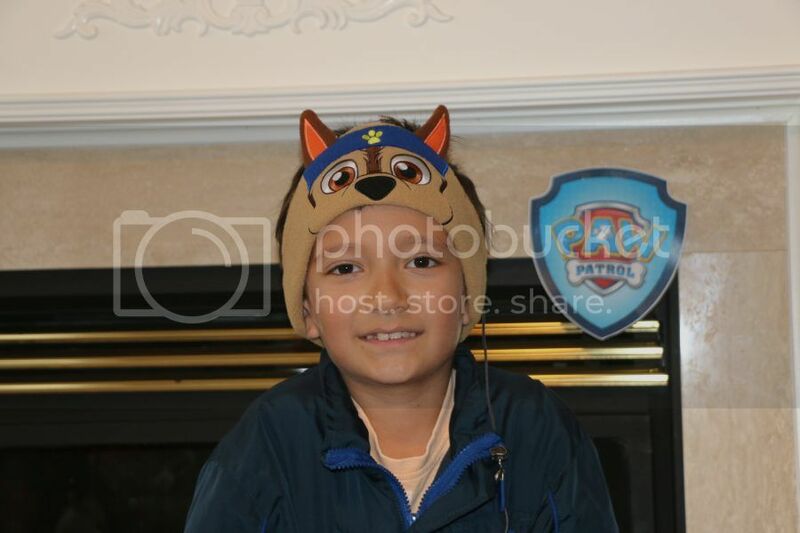 Teddy is a huge fan of Paw Patrol series, so he was excited to get Chase headband. There are also Marshall and Skye character headbands available. Teddy thinks it is very soft and convenient headband, he says he does not need to adjust it, hold when going from one room to another, from living room coach to his room. He says he even forgot he has something on his head; the headband is so soft and fits his head perfectly. I also like that it has volume control, so kids gentle hearing will not be hurt due to high volume. CozyPhones combine three features: headphones, headband and sleep mask. With upcoming cold weather having cozy headband would be very useful, it will not be probably a major head wear, but in case of moving from one place to another or sudden gusty wind the headband can do a good job protecting kids’ ears and head. If you travel a lot with kids, then CozyPhones is perfect accessory, useful in a car, bus or a plane. As a sleep mask CozyPhones is very convenient to use, no need to take headphones and a sleep mask separately, CozyPhones combine the quality of both. For example, Teddy after watching videos in his Chase CozyPhone headband in a car, he just pulled it over his eyes and fell asleep. In case kids get messy and CozyPhones headband gets dirty, you can easily wash it - just remove speakers. Overall, CozyPhones is cute product for kids, comfortable, lightweight and good for children’s health. And they are affordable too, around $29 CAD on CozyPhones website or on Amazon.ca you can get cute quality headphones for kids and adults. With available characters, these headbands are a huge hit. For our readers we have a special coupon code to use to get 10% off the purchase in the selection of CozyPhones: TEDDY10. And that's not all, we are excited to partner with CozyPhones and give a chance to our US and Canadian readers win one of CozyPhones for themselves. Please fill the Rafflecopter form below and Good Luck! The giveaway ends October 30, 2018. These are so awesome, I love that they don't have anything to go into the ears, my granddaughter would love to have the Skye ones from Paw Patrol, but sadly that is US only, so I would have to choose the Pink Bunnies!! I like the fox design. I really love the unicorn and the cat styles. I would like the Fox ones. I just LOVE the fox ones. Thanks! I like the unicorn design. My grandson would love the WhatIf Monster. I like the Unicorn ones. I like the panda design! The panda ones are adorable. My favorite are the fox ones! My eldest currently has the fox and she adores them. I would love to get the unicorn for my youngest! My daughter would love the cat cozy phones . I would pick the Unicorn for my daughter. The Pink Kitty and the Unicorn are my favourites. The panda ones for kids are cute, I like the Contour Series Sleep Headphones for me! I would love the fox! I love the unicorn design. Thanks! The fox one is adorable! I would love to see my granddaughter in the unicorn ones. Id choose the violet contour series headphones! I LOVE that they are for children and adults! The Unicorn would be my first choice, it is fabulous. My top favorites for my grandson are the monster, Marshall the dog and the Fox. For ME, I'd LOVE the sleeping ones but of course, like most Gramma's I would pick them out for my grandson 1st! My favorite design is the Lion! They're all super cute though! I really like the fox design. I like the WhatIf Monster design the most!! I love that the headphones are work with a variety of devices!!! They seem very innovative and perfect for little kids! I really like the Cat CozyPhones. 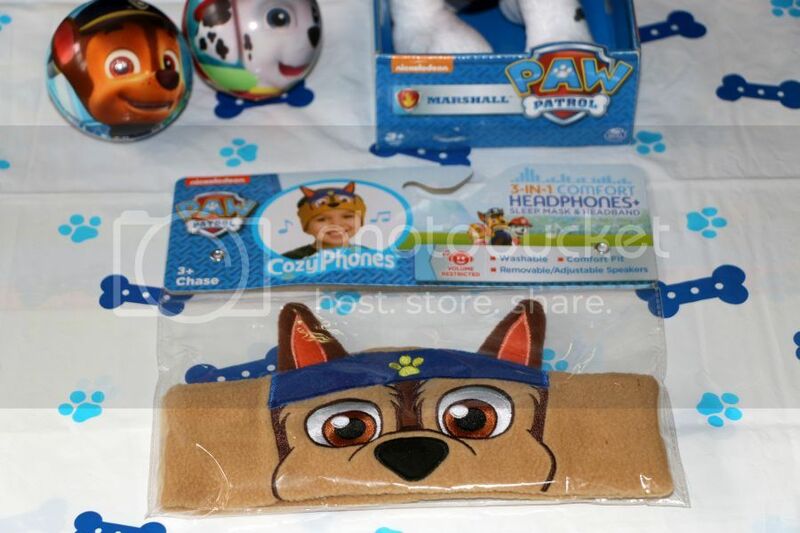 Our, grandson, would really love and appreciate their Paw Patrol Marshal headphones. Loving them right now! Thanks for the super giveaway opportunity. For kids designs I like the Panda ones best. For myself I would choose the Black Sleep Headphones as these would be awesome to wear to bed & also when on airplanes! I really like the Chase pair. My daughter would love to have the unicorn cozyphones!!! I would pick paw patrol my son is a huge fan amd loves them!! I love the unicorn headband design for my daughter, so adorable!